When I come across unfamiliar terms on the Internet, I often open up a new browser tab to do a little bit of research. It’s not a whole heck of a lot of work to do so, but by the time I shut my computer down for the night I typically have 20 or 30 open tabs. A new browser plug-in called Curiyo wants to help cut the clutter and boost your productivity. In simplest terms, it’s a one-click encyclopedic tool. Just “long click” (that is, hold your mouse button down for a full second) unfamiliar terms and names that appear on the web, and Curiyo will pop up an info box right in your browser window. In it, you’ll be able to view Wikipedia entries, recent tweets about the subject, images and YouTube videos, all without leaving that page or opening a new browser tab or window. Curiyo will also put a dashed line under interesting terms to signify that the app can provide extended information about them. 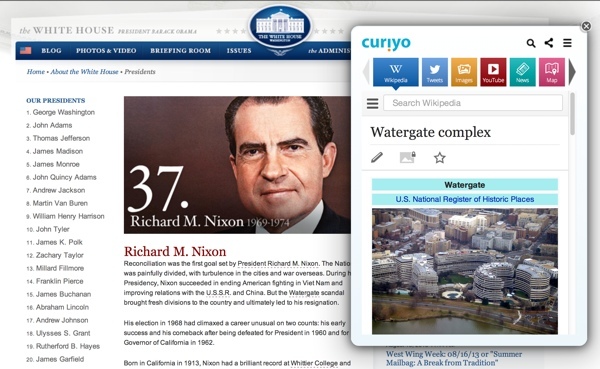 Visit to the White House’s page on Richard Nixon, for example, and the plug-in will underline “Watergate.” Curiyo is a great tool to help with your kids research projects or to simply make more sense out of technical terms you might see on a site such as Techlicious. Curiyo is a free download that currently supports most major browsers: Microsoft Internet Explorer, Firefox, Google Chrome and Apple Safari. A mobile version is coming soon. To learn more about the plug-in, visit the Curiyo website. I currently have 40 tabs open on my browser.